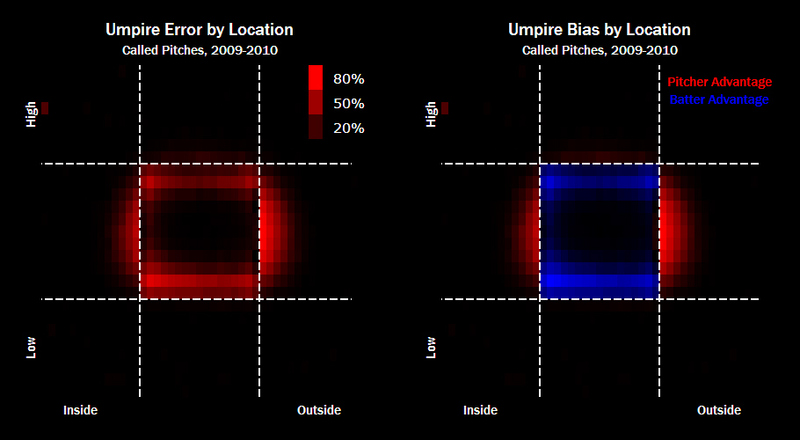 While some sources of umpire error are rather confounding, some are far more intuitive. Take, for instance, the distance between the umpire's eye and the location of a pitch. Umpires tend to position themselves over the inside part of the plate (this provides more protection from batted balls), putting themselves at a disadvantage when calling outside pitches. We witness the same effect when it comes to the height of the pitch: the farther away from the ump's eye when the pitch crosses the plate, the more likely the umpire will make a call that is inconsistent with that of the Pitch F/X system.